The dark area at the top, will not show up in a print-out, so you can print this sheet directly from your browser. It is also designed to copy headings and footers to each page, so it looks reasonable, though you may need to set your browser's 'page setup' to print in landscape mode for it to look right. You'll see check-boxes for all the questions on your entry forms (and for all the questions on your membership forms if your event is linked to a group). Tick these and click 'change' to add them as columns to your signing on sheet. If you have a large entrylist, you may want to print out a particular range of numbers and keep them separate. For example, suppose you have separate booths for 'numbers 1-100', 'numbers 101-200' in order to speed up the on-the-day registration process: you can put '1' and '100' in the 'from' and 'to' boxes, click change and print out rows that cover those numbers. You can then click 'next' to print the next set of sheets. If you have multiple events, your signing-on sheet setup will be automatically shared between them. That way you get it set up how you like once and for future events you just click the link and print. You want to save the details for later. 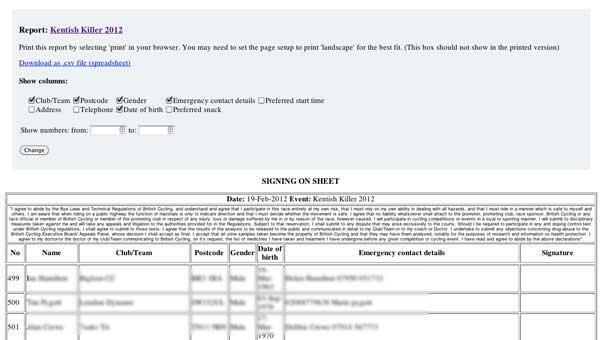 That's it, hope our signing-on sheet generator saves you time!